Sometimes you come home, look in the fridge and think ‘I just can’t be bothered, let’s get a takeaway’. Or in my case, with no restaurants willing to deliver to the Suffolk outback, settle for beans on toast. Reader, this could be our salvation. It doesn’t take any longer than twiddling your thumbs waiting for a delivery, it’s healthier (like any of us care at this point) and it’s cheaper. It does assume though that you have some chicken joints knocking around your fridge and an assortment of veg and spices. I cheated on the spices – I used a bought Lebanese Seven Spice mix. Sue me. If you don’t have any or want to make your own, mix equal amounts of ground black pepper, allspice, cloves, nutmeg, cinnamon, ginger and fenugreek. I served the finished dish with freekeh, ready-made from a packet. What? It had been a long day. Prepare the vegetables. 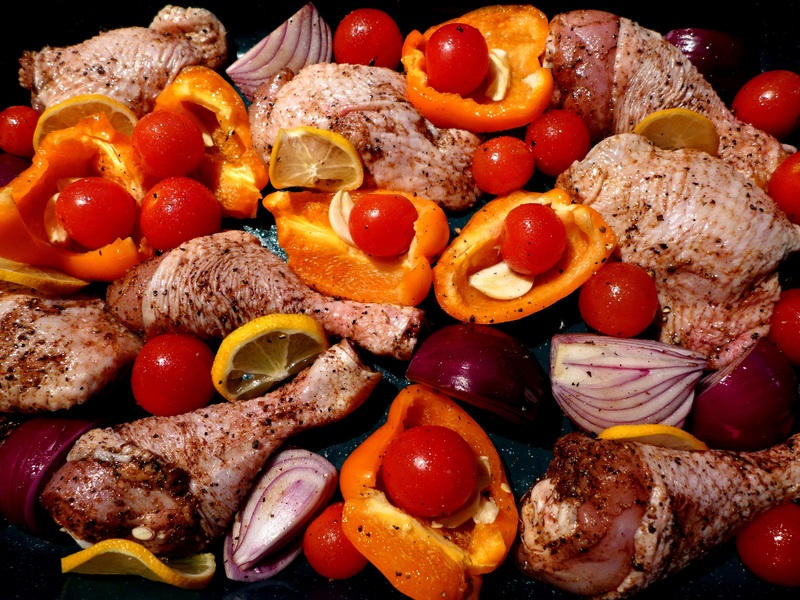 Place the chicken in your biggest baking tray and put a sliver of garlic and a cherry tomato in each pepper quarter. 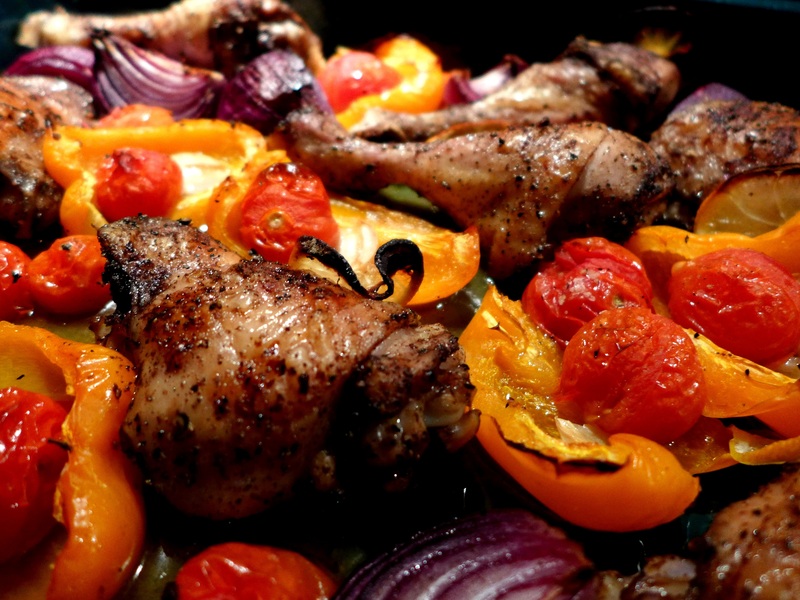 Arrange around the chicken, scattering in the remaining tomatoes and the onions. Tuck the lemon slices up against the chicken pieces and squeeze over the remaining lemon half. Season with more salt and pepper, drizzle with a little more oil and roast in the oven for about 40 minutes, or until the chicken is golden brown and cooked through and the vegetables are beginning to char a bit at the edges. This entry was posted in Chicken and other poultry, Mains and tagged Lebanese 7 spice, Lebanese Seven Spice Chicken, quick suppers, storecupboard dinners by Linda Duffin. Bookmark the permalink. This sounds wonderful! No take-out delivery here on Beaver Island, either! Thanks, Cindy. Thank heavens for store cupboards! The hugest warm smile: have used Baharat for decades and most often reach for it when short of time but wanting long on flavour! You have managed to ‘make’ if even juicier than I . . . shall happily copy!! Big warm smile right back at you! Thanks, Eha, it’s delicious, isn’t it? Love the sound of this, Linda. On business trips to the Middle East (mostly Saudi) yrs ago they told me that much of their cuisine was Lebanese … just delicious! Will def give this a go. Thanks. Thanks, Chris. Yes, Lebanese food was the default upmarket setting when I was travelling in the Middle East too. It’s a fantastic cuisine. I think Seven-spice is an incredibly under-used spice mixture. Love the combination of veggies you’re using. Do you prepare a sauce with this, or just use pan drippings? Thank you! I find it’s moist enough without preparing a separate sauce, so I just scoop it out and serve it with the veg and lemon.